Falls Church-based Northrop Grumman Corp. has filed suit against Virginia’s state government, seeking damages of more than $10.2 million. The lawsuit filed in Richmond Circuit Court is the latest development in the unraveling of a 13-year, $2 billion IT services contract between the commonwealth and the company. State officials are replacing the single-provider arrangement with deals with many vendors. In its suit, Northrop Grumman accuses the state of turning its back on a mediated settlement with the company, the Richmond Times-Dispatch reported. State officials told the newspaper that Virginia would have faced open-ended IT costs if Gov. Terry McAuliffe had signed the agreement. A spokesman for the governor said that the lawsuit is without merit. 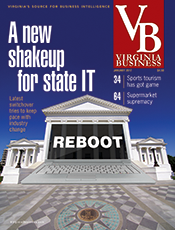 In its January issue, Virginia Business looked at efforts to disentangle state IT services from the Northrop Grumman contract. State officials said at the time that the IT services industry has changed dramatically since the agreement went into effect. The changes resulting from the Virginia-Northrop Grumman breakup could affect not only state IT operations but also technology hubs created in Central and Southwest Virginia.